Okay, I have to tell you that I am super excited to be sharing this next recipe with all of you. As a sports mom, I'm part of quite a few team dinners and team dinners always require some sort of passing dish. Meatballs are absolutely perfect for this! My football boys like to toss them onto some bread and make sandwiches, so sometimes I throw a bag of sub buns down on the table next to them! I don't think I've ever come home with leftovers! Mix ingredients together in a large bowl. Shape into walnut sized balls. Place on waxed paper lined cookie sheets. Freeze. 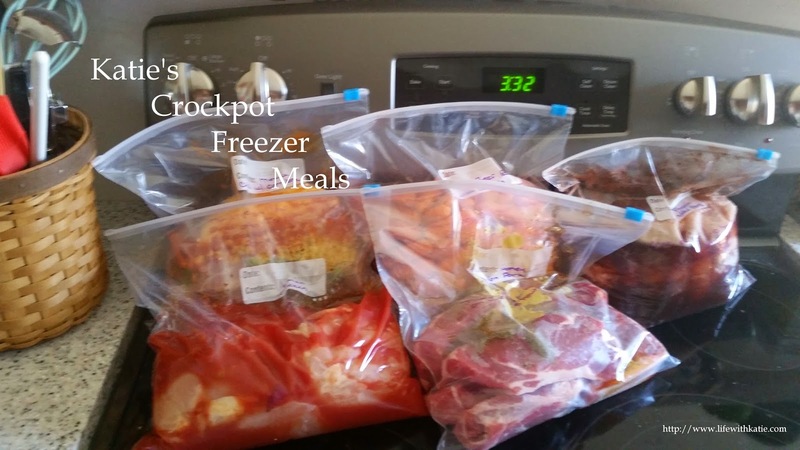 When totally frozen, place into gallon sized freezer bag. Mix all ingredients together. Once meatballs are frozen and placed into the bag, pour sauce over the top, squeeze out any remaining air, seal, and freeze. Thaw in refrigerator overnight. Place into crock pot and cook on low for 8-10 hours *or* on high for 1 hour, then switching it to low for 6-8 hours.